Yzel Borja ended her playing career at the University of South Florida on quite a high note as she was voted MVP by her teammates and received the Coaches Award. The star player now hopes to begin a career in teaching either in California or New York. Yzel first picked up a rugby ball in the Fall of 2013 after losing a wager to a friend. “I lost a bet to my partner and at that point he had been playing rugby for about 5 years and was obsessed. So the consequence for losing the bet was that I had to play rugby,” explained Borja. Borja, a center and scrumhalf, has enjoyed her time playing USF rugby. She sees a ton of potential in the rookies they had this season and hope they can continue the success USF has had with rugby with the help of their amazing coaching staff. “This year the majority of our players were rookies but you can see the connection they have with each other and the sport. They’re really great kids with so much talent and potential. We also have great coaches that really care about the team and give up so much of their time to the program,” said Borja. Since Borja has loved her time at USF, it is pretty hard fro her to figure out her favorite moment. The one that stuck out most to her was a game against Fort Miami. 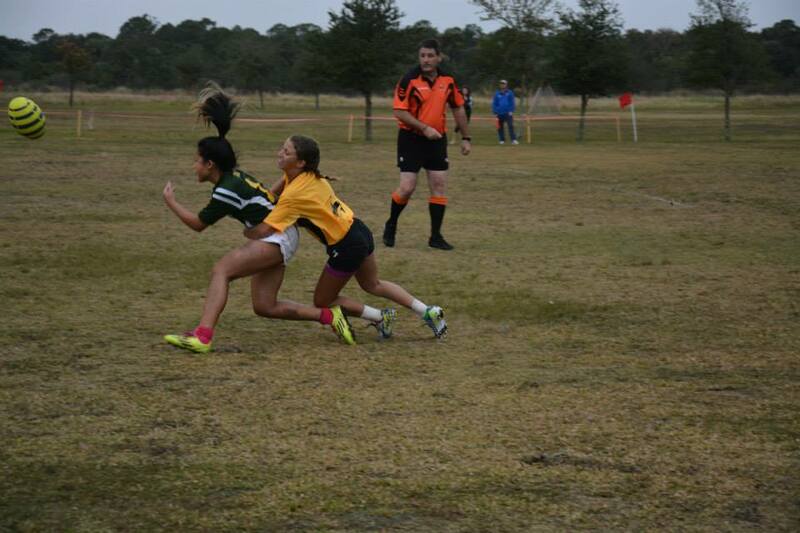 ” The moment that sticks out in my head was when USF Women’s Rugby played against Fort Miami Women’s Rugby this past Turkey Tens tournament in Sebastian, FL. For our first match of the day, we were up against Fort Miami who play at a higher level than us. It is always a fun learning experience against them and I knew it would be tough but we really held our own. I remember one of the rookies getting tackled and we were pretty close to the left side of the pitch. I and two other girls were calling for the offload but all I could see was this open space and I was just yelling for it and sure enough we made eye contact and she chose me to offload the ball to. Then, I just took off. I took a slight angle to the left and two girls on the other side of the pitch started tracking me towards the try zone. Once they were five meters away from me, I cut back in and changed directions and started running right. The closest girl got a hand on my body but her momentum was taking her the other way so it was easy to get past her. The next girl, who was a little bit farther, almost got me as she wrapped me but I kept moving my legs and at this point I was already in the try zone. It felt amazing to be the one to get our one and only try against them for the match,” said Borja. With the valuable lessons and life long memories Borja gained from rugby, it is no wonder the sport means the world to her. “Rugby means a lot to me. It means pain, joy, fun, learning, strength, and resilience. Rugby has brought so much of these things into my life. It is an amazing test crafted to challenge you, to force you to do your best in every situation, especially in the worst situation, and I love that,” exclaimed Borja. As Borja moves on from USF rugby, Gift-Time Rugby would like to wish her the very best in her future endeavors!